DIE Sabbati, videlicet, 2 die Julii. Lieutenant of The Tower ordered by the King to release Benyon. The King's Warrant for it. Benyon to be attached by the Gentleman Usher. 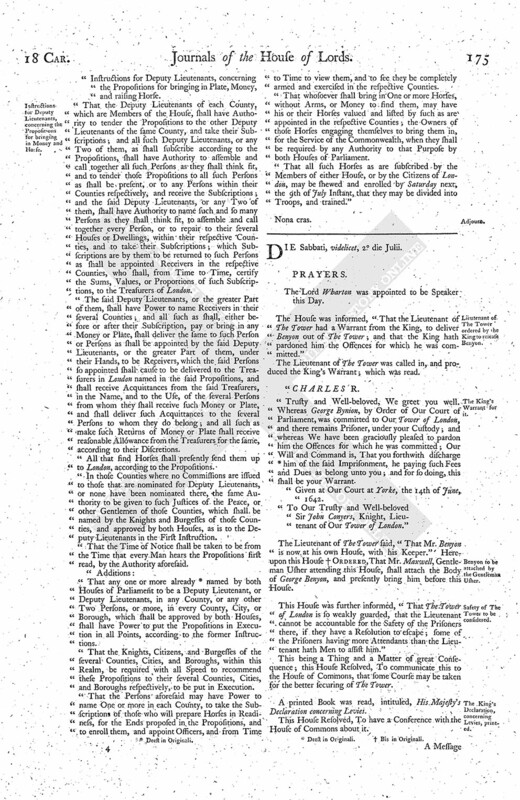 The King's Declaration, concerning Levies, printed. Muschamp to be examined, about his Threats to the Earl of Northumberland. Amendment on the Scots Treaty. Message to the H. C. with the Ordinance appointing Lord Wharton to be Lord Lieutenant of Bucks. Muschamp's Papers to be seized. Herbert and Saul attached, for the Proclamation for the Commission of Array. H. C. agree to Lord Wharton's being Lord Lieutenant of Bucks. E. of Portland to stay Ships going to the Rebels. The House was informed, "That the Lieutenant of The Tower had a Warrant from the King, to deliver Benyon out of The Tower; and that the King hath pardoned him the Offences for which he was committed." The Lieutenant of The Tower was called in, and produced the King's Warrant; which was read. "Trusty and Well-beloved, We greet you well. Whereas George Bynion, by Order of Our Court of Parliament, was committed to Our Tower of London, and there remains Prisoner, under your Custody; and whereas We have been graciously pleased to pardon him the Offences for which he was committed; Our Will and Command is, That you forthwith discharge (fn. 1) him of the said Imprisonment, he paying such Fees and Dues as belong unto you; and for so doing, this shall be your Warrant. "Given at Our Court at Yorke, the 14th of June, 1642. "To Our Trusty and Well-beloved Sir John Conyers, Knight, Lieutenant of Our Tower of London." The Lieutenant of The Tower said, "That Mr. Benyon is now at his own House, with his Keeper." Hereupon this House (fn. 2) Ordered, That Mr. Maxwell, Gentleman Usher attending this House, shall attach the Body of George Benyon, and presently bring him before this House. This House was further informed, "That The Tower of London is so weakly guarded, that the Lieutenant cannot be accountable for the Safety of the Prisoners there, if they have a Resolution to escape; some of the Prisoners having more Attendants than the Lieutenant hath Men to assist him." This being a Thing and a Matter of great Consequence; this House Resolved, To communicate this to the House of Commons, that some Course may be taken for the better securing of The Tower. A printed Book was read, intituled, His Majesty's Declaration concerning Levies. This House Resolved, To have a Conference with the House of Commons about it. To desire a Conference, touching a printed Book, intituled, His Majesty's Declaration concerning Levies. Appointed to draw up what shall be delivered at this Conference. That they will give a present Meeting, as is desired. The Lord Kymbolton reported what the Committees thought fit to be delivered at this Conference with the House of Commons. Ordered, That the Earl of Holland, Earl Bedford, Earl Essex, Earl Pembrooke, and the Lord Robartes, shall examine Edmond Muschamp, concerning the Earl of Northumberland. Ordered, That this Proposition be sent down to the House of Commons; which was accordingly done, by Message, by Sir Robt. Rich and Mr. Page, because it is concerning Money, and to (fn. 3) be paid by them; therefore their Lordships send it down to them to consider of. 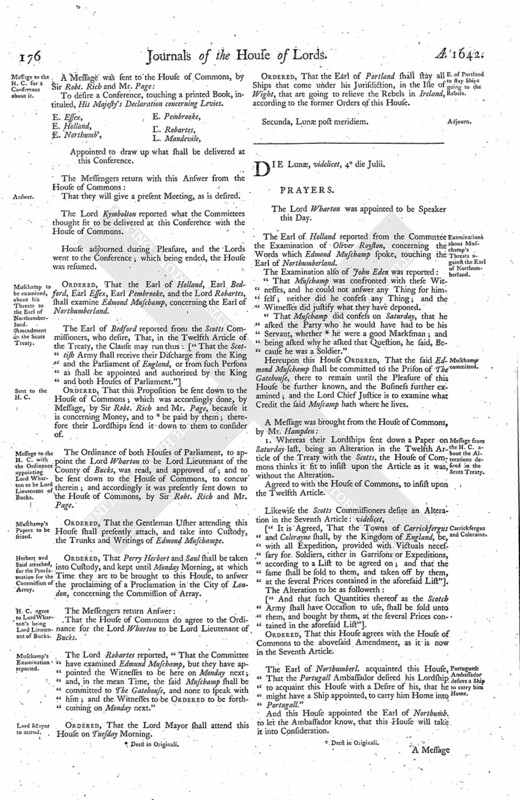 The Ordinance of both Houses of Parliament, to appoint the Lord Wharton to be Lord Lieutenant of the County of Bucks, was read, and approved of; and to be sent down to the House of Commons, to concur therein; and accordingly it was presently sent down to the House of Commons, by Sir Robt. Rich and Mr. Page. Ordered, That the Gentleman Usher attending this House shall presently attach, and take into Custody, the Trunks and Writings of Edmond Muschampe. Ordered, That Perry Herbert and Saul shall be taken into Custody, and kept until Monday Morning, at which Time they are to be brought to this House, to answer the proclaiming of a Proclamation in the City of London, concerning the Commission of Array. That the House of Commons do agree to the Ordinance for the Lord Wharton to be Lord Lieutenant of Bucks. The Lord Robartes reported, "That the Committee have examined Edmund Muschamp, but they have appointed the Witnesses to be here on Monday next; and, in the mean Time, the said Muschamp shall be committed to The Gatehouse, and none to speak with him; and the Witnesses to be Ordered to be forthcoming on Monday next." Ordered, That the Lord Mayor shall attend this House on Tuesday Morning. Ordered, That the Earl of Portland shall stay all Ships that come under his Jurisdiction, in the Isle of Wight, that are going to relieve the Rebels in Ireland, according to the former Orders of this House.